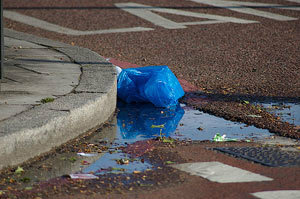 When they're not being re-imagined as metaphorical objects in overrated films, plastic bags are unsightly things. A familiar bane of London's landscape, the "urban tumbleweed" is an ecological nightmare. We all know that we're supposed to ditch them in favour of reusables; yet 13 billion bags are issued each year in the UK alone. That's 220 per person. Only one in 200 bags is recycled, while the rest are doomed to landfill sites where they'll break down in, ooh, about 400 years, give or take. Back in September we reported on a survey by London Councils that asked if there should be a London-wide levy on plastic bags. The results are in, and happily the proposal has received overwhelming support: over 90% of respondents backed some form of action, while nearly 60% called on the government to banish the blighters from our streets altogether. Of course, while we sneer at the plastic and all the trouble it brings, in reality we should be also looking at the shoppers who choose them . To (very loosely) paraphrase Charlton Heston: "Plastic bags don't injure cute baby seals. People injure cute baby seals". And a late-night shop at Iceland can often result in a tricky conundrum: choose plastic and pollute the world, or else look like a shoplifter as you struggle down the High Street with a pound of satsumas stuffed into your jacket pocket. The Anya Hindmarches of this world may make fabric bags briefly fashionable, but in reality most of us are still all-too wedded to the convenience of the plastic variety. We all need to change our behaviour, regardless of whatever the Government decides. You can read the full results from the survey here.